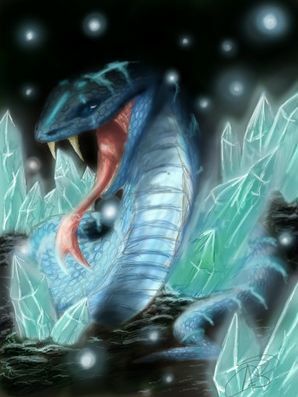 A large serpent made of ice and snow that hoards treasure. Flowsnake (Nix Anguis) is a boss-monster originally named by the first Heroes and Heroines of Godville as Nix Anguis, and later translated incorrectly to Flowsnake. The Flowsnake is a 20-foot long serpent made of snow and ice, it's internal organs can be seen through its crystal clear icy body. It lives in cold, frozen maze-like dungeons made of ice and sits upon a pile of treasure. Its dungeon has many winding paths about the width of the Flowsnake which can sometimes lead to other sections of the dungeon. These tunnels between larger rooms were probably made by the Flowsnake and can go on for miles. It sleeps for a few hours out of the day, but is usually awake, guarding its stash. Not much is known about the Flowsnake except it is highly dangerous and a tricky monster to defeat. Be weary of some of it's known attacks. Snow Breath: A freezing cold blast of snow fires from its massive maw, can cause instant frostbite. Snow Blinding: Since the dungeon is just ice, the Flowsnake's heart may suddenly glow incredibly bright, reflecting off the snow and ice, blinding the Hero or Heroes. It may then slip away to another area of its dungeon. Ice Fangs: Its fangs are two feet long and made of solid ice. Sharp Tail: Sometimes its tail comes to a sharp point, if the tip of its tail is chipped or broken off from a previous battle it will use a sharp object from it's treasure stash or a weapon from a deceased Hero as a replacement. Liquid Eyes: Its eyes are made of water and of course cannot be damaged because of this. This page was last edited on 19 February 2019, at 13:35.